Yesterday Dan and I were able to be at the hospital while the doctor did rounds and we got to hear a lot of news. The amount of sodium Abby is receiving each day has been cut in half. At the end of the week, she’ll have her levels tested again to decide if she still needs it or not. Today they took some blood for some routine tests. Of particular interest to us this week is her blood count. At birth, it was 51. Last week, it was down to 27. This is normal, and it is expected that it will decrease again next week before starting its way back up. If it gets below 23, Abby may have to have a blood transfusion. When they took her blood this morning, they were hoping to also do a test to measure how well her bone marrow is doing to see if she is producing blood well on her own yet. If she’s producing well, or if she has no other symptoms, she will probably not need a blood transfusion unless her count goes as low as 20. Abby gets to try to nurse twice a day now. On Monday night Abigail succeeded for the first time and actually ate a little all by herself. She wasn’t successful on Tuesday morning, but on Tuesday night she succeeded again and ate for six minutes before falling asleep. This morning we started to weigh her before and after feedings to find out how much milk she’s eating. Today, she didn’t get any, but we’ll try again tonight. At rounds, our doctor said that we want to wait a few days to see if she’s more consistent at “transferring milk”. Once she has a few good transfers in a row, they will talk about starting her on bottles. Our doctor warned us that it would probably not be until the end of the week or until early next week and asked us if that sounded reasonable. Now, for anyone unfamiliar with the whole NICU routine, bottles are the final hurdle. Once a baby gets started on bottles, they will be offered bottle feedings every three hours. The amount that they take in will be subtracted from their full feed amount, and the rest will be fed by gravity. (Oh yes, I forgot to mention that Abby is off the pump! From now on, her feedings are just going in by hanging a syringe and allowing gravity to pull the milk down into her belly) Usually it’s a week or two before babies can stay awake long enough to eat all of their feeds by bottle. Once they take in all their milk by mouth, it’s only a day or two before they go home! So, all that to say, I was thrilled at the prospect of starting bottles next week. It’s really all up to Abby, though, to see how fast she learns to eat, and can stay awake long enough to eat. Our doctor ended rounds by saying that it’ll probably be a couple more weeks before we talk about discharging her. She was sounding apologetic the whole time, but Dan and I were so happy to hear her say a couple of weeks when we were originally planning on it taking another couple of months. Recently Dan and I bought a chest freezer where we can store Abby’s extra milk until she needs it. As I transferred the milk from our regular freezer to the chest freezer, I sorted out a lot of bottles from the first five days after Abby was born. This early milk (colostrum) is different from regular milk. It has a much higher fat content and is yellow instead of white, which is why it is referred to as “liquid gold” in the NICU. I started bringing in this colostrum on Sunday to give to Abby in hopes of boosting her weight, along with the other good stuff she gets from colostrum. Well, it must have worked. Babies are routinely weighed every other day and expected to gain around 30-40 grams (about 1 ounce). When Abby was weighed last night she had gained 142 grams (about 5 ounces). So she is now up to 4 pounds! The nurse was so incredulous about such a large weight gain that she weighed her again to check, but the second weight matched the first. Abby is officially heavy enough to ride in some car seats. It may not be good practice to set a coming-home-date in our heads (lest we end up being disappointed), but it’s really hard not to do it. Things just seem so much nicer when there’s an end date in mind. So, after rounds yesterday, my coming-home-date-goal is November 5. Dan thinks it’ll still be a month before Abby’s home, but I’ve always been the more optimistic (impatient) one. It seems probable that Abby may be with us for Thanksgiving after all, as long as things continue on the way they have been going. 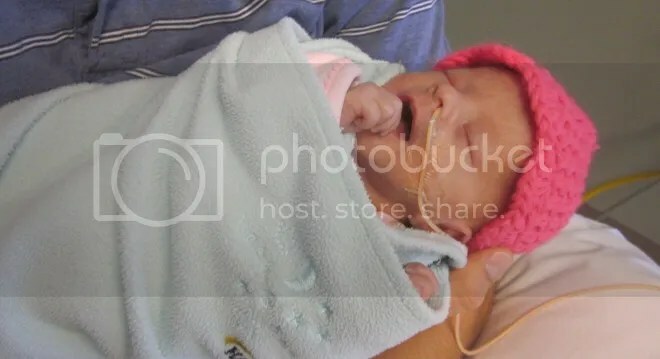 This entry was posted in Abigail Faith and tagged Abby, family, NICU by justeeni. Bookmark the permalink. Thanks Justine for the updates. She seems to be doing so well. Praying….. Thanks for sharing all the good news! She’s really doing great, and we are so thankful. By the way, November 5 would be a GREAT day to take her home…our anniversary!!!! No better gift would there be! Love you all, still praying..